The ACI 600’s advanced integrated platform expands the way you live with your audio. The ACI 600 suite of options focuses on the core technologies of our high dynamic range DAC, precision volume and system control, ethernet streaming, programmable phono stage and headphone technologies, powered by ultra-low noise amplification for the ultimate all-in-one high performance solution. The ACI 600 is designed to manage the complexity of all audio source and control functions with ease and efficiency. The volume and system functions are controlled by manually pressing and rotating the control dial on the top of the unit, or by using the IR custom remote control, or with your iPhone/iPad and the custom iOS app. The fully programmable display is easy to read and illuminates system status indicating source and volume. It also displays all programming functions and serves as the streaming display for meta data. All source inputs are asynchronously re-clocked into the fully balanced advanced segment DAC measuring below 0.0005% distortion and 127dB of dynamic range. By stripping away the source clock and using Bel Canto’s custom ULN master clock circuitry we significantly reduces both jitter and distortion preserving the delicate audio signals from all sources. Asynchronous ethernet connects you to the most compelling and power musical source available today. Bel Canto’s proprietary asynchronous ethernet and USB-A inputs provide the highest level of performance for high resolution files up to 24bits at 192ks/s, MQA, and DSD64.  This allows you to connect to a variety of subscription streaming service or source from your personal library that is stored on a NAS (networked attached storage) drive, or a multi-terabyte independent drive to the USB-A all providing full server function with complete iOS wireless control using our SEEK control App. Asynchronous Digital SPDIF AES, RCA and Toslink inputs all operate at 24/192Ks. Asynchronous USB2.0 Audio is compatible with any PCM source up to 24/348, MQA, and DSD 128 (DoP). Windows-based computers require our custom driver. USB2.0 works natively in OSX. RS232 is designed to support easy integration with sophisticated whole house control systems. The MM/MC phono section is a low noise, low distortion circuit that is fully programmable for optimum application with wide range of quality cartridges from high output MM 2.5mV to 5mV to low output MC 0.25mV to 0.5mV to optimized performance. The line level analog input also can be programmed to gain match your analog sources and achieve the best performance from all analog sources. The line output can be connected to a powered subwoofer. The rear mounted headphone jack opens up high quality sound for your favorite headphones. Plug in your headphones and the ACI600 configures itself into a superb headphone amplifier with a high performance buffer stage that can drive down to 32 ohm. Control the output level using the main control, allowing you to select the headphone or main speaker output while leaving the headphones in place. The ACI 600 has WBT vibration isolated NextGen speaker connectors delivering the purest audio signal to the speaker. The fully insulated design is made from a hybrid of functional materials. The tightening nut acts as a vibration damper against impact sound as well as a pressure indicator. Made from pure fine silver each post accepts 4mm2 bananas and ¼ inch spades. Our new AMiP (Asynchronous Multi-Input Processor) Platform manages all the inputs of the Black Integrated amplifier. It is a powerful custom asynchronous core with 6 processor units that consist of: 2-32 bit XMOS general purpose processors, 2-32 bit ARM processors units as well as 2-dedicated audio processors. These together handle the ethernet interface that works with Roon Ready and DLNA servers, USB-A host streaming input, a USB2-24/384 input, legacy digital SPDIF/AES/TOS inputs and analog line level and phono inputs. The AMiP platform handles DSD and MQA processes and our custom Time Optimized Filter with integer up-sampling. There is a high-performance MM/MC programmable phono stage and 2-line level inputs that feed a high dynamic range 24/192 ADC into the processor core. Dual free running Ultra-Low Phase Noise Master Clocks direct all the digital processing and strip any incoming jitter from external digital input streams. There is a 32-bit ARM core processor that handles the user interface and coordination of the AMiP Platform. The AMiP platform feeds our HDR-II DAC core running on a dedicated power supply through a custom digital interface. This is where volume control is performed using 32-bit math, the HDR-II core achieves 127dB of dynamic range, higher than any analog volume control could achieve for completely transparent volume control function. The HDR-II also has an asynchronous interface with a free running Ultra-Low Phase Noise Master Clock positioned adjacent to the Digital to Analog Converters. It includes a 64-bit dedicated audio Digital Signal Processor to provide completely transparent Bass Management, sophisticated Tilt and Bass EQ functions and allows us to fine tune things like the RIAA response in the phono section. There is a secondary DAC (112dB dynamic range) that drives the line output and provides headphone and subwoofer output capability with bass management features. Bel Canto’s High Dynamic Resolution-II (HDR-II) core is a highly refined Digital to Analog Core rendering high levels of definition and musicality. It is the culmination of more than 20 years of audio DAC design evolution. With the HDR-II Core we have improved the dynamic range, analog output stage design and digital filters while reducing spurious signal generation and jitter related errors. Our new HDR-II Core has demonstrated that we can increase the resolution of musical detail, and improve listenability and perceived quality of the recorded music. This is in contrast where ‘transparent’ and ‘revealing’ often means ‘bright’. The HDR-II Core presents the original music with high levels of clarity and emotion. Our HDR-II Core starts with a deliberate and careful choice of DAC technology. This choice defines the ultimate achievable performance and is defined by several key specifications. Our research has directed us to the best DAC technology, confirmed through extensive testing and listening. Bel Canto chooses the most refined CMOS digital to analog processor to provide superior dynamic range through extremely low noise, distortion and jitter sensitivity. The analog output section takes best advantage of the underlying CMOS technology to achieve the highest levels of analog purity and uncompromised performance. This Advanced Segment Technology DAC combines both multi-bit and multi-bit delta-sigma technology to deliver superb performance with a dynamic range of 132dB and transparent linear-phase digital filters. The CMOS analog conversion operates in a Constant Voltage, Class A Differential Current mode for minimal distortion and best analog performance. Through detailed FFT analysis we characterize DAC performance over the complete dynamic range, insuring that the DAC analog outputs behave in a true analog fashion. As with the best analog circuitry our DAC technology exhibits diminishing levels of distortion and spurious signals at lower output levels were most of the audio signals live. Our HDR-II Core analog behavior is contrasted in the following figures with an increasingly popular DAC technology that looks good on paper but does not deliver true analog purity over the audio dynamic range. It is critical that a DAC reproduce low level signals cleanly with no added distortion or spurious energy above the noise floor to color the sound. 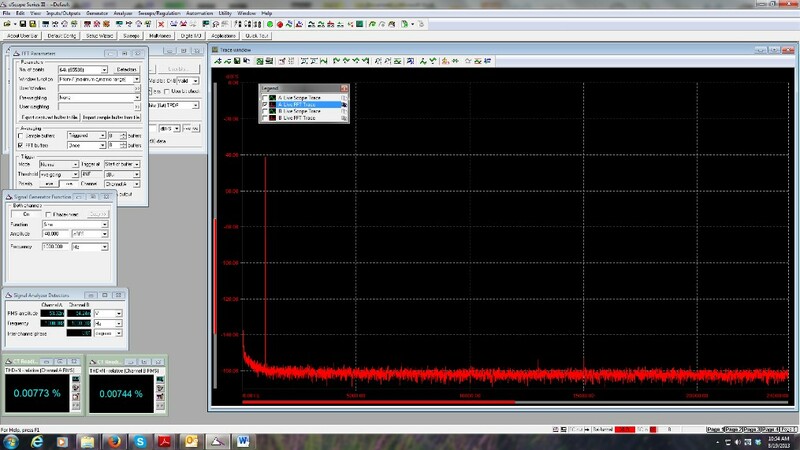 Note how clean the graph of our HDR-II Core is in Figure 1 with only the 1kHz, -40dB test signal appearing above the very low noise floor below -150dB. The extremely pure results in our Figure 1 HDR-II DAC results in a very pure lifelike sound quality. This was a major factor in our original choice of this DAC technology and our continued investment in this technology. The HDR-II Core digital design starts with our Ultra-Low Phase Noise Master Clocks. These superior clocks are free running and fed from dedicated ultra-low noise analog power supply regulators. There are 2 stages of asynchronous interfacing to ensure that the final DAC output is jitter free and independent from any noise on the incoming digital signals. Our custom MQA based digital filters define an optimized impulse response from all sources, MQA, PCM, Analog and DSD. 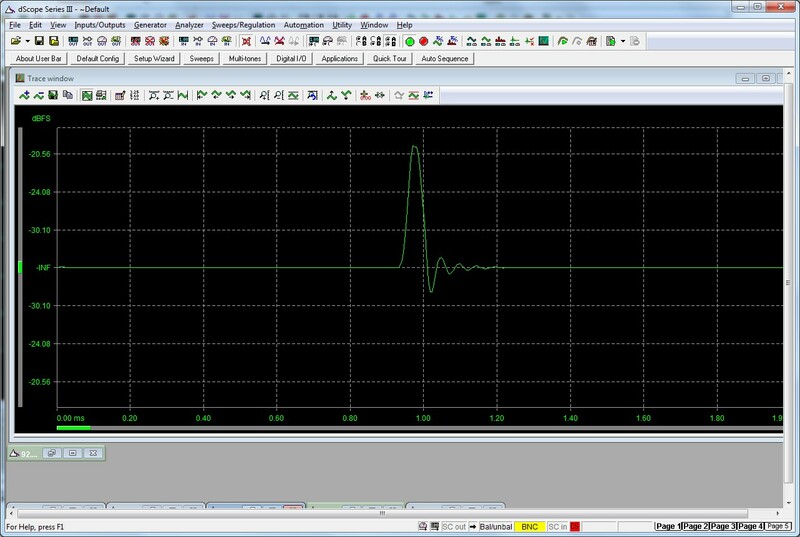 Figure 3 shows this impulse response with a 44.1kHz CD test signal. Our custom digital filters are designed to largely mimic the time domain response of an audio signal traveling through 10 meters of air. This superior time domain response insures the best sonic performance for all signals reproduced by our HDR-II Core DAC technology. MQA, High Bit Rate PCM, Analog and DSD all approach the impulse response resulting from travel through 10 meters of air, retaining the critical time relationships in the original music. A critical advantage of our HDR-II Core architecture is how the Class A Differential Current Mode output from our DAC operates in concert with our custom balanced analog section to best preserve the original dynamics of the recording. The large constant-bias differential currents impose pure Class A operation to every part of the analog output stages, every precision resistor, film capacitor and amplification device is biased with constant current and voltage. This constant bias keeps all components in thermal stasis and insures that all the original signal dynamics are retained. Our proprietary SSHA (Single Stage High-Current Amplifier) interposer module is used in the Black HDR-II and Black EX DAC Core design. This is a very fast, low noise amplifier with a single-stage folded cascode architecture and over 500mA of peak current output capability. It maintains constant very low distortion levels through the audio band because of its high open-loop bandwidth. The SSHA module brings a further element of dynamic resolution and contrast to the HDR-II Core. The vertical modular design permits a tight, efficient Printed Circuit Board (PCB) layout that combines the best of IC based and discrete component design. The PCB represents a final degree of design refinement that is especially critical when the circuit is capable of 130dB of dynamic range or more. Through careful parts choices, architectural considerations and design details, refined over numerous generations, Bel Canto’s HDR-II Core has been optimized to render pure, dynamic analog signal quality from all music sources. Our dual stage phono architecture is used in the ACI 600. It consists of an Ultra-Low noise input RIAA amplifier with precision filter components and fixed 40dB gain. This is followed by a digitally controlled analog variable gain stage to adapt the RIAA gain for a broad range of MM and MC cartridges. Input loading is controlled from the menu so that you can load your MC cartridge with the optimum impedance. This new Phono Architecture is optimized for accurate, low noise RIAA filter operation and compatibility with many cartridges. The Headphone output is driven from a dedicated 112dB dynamic range DAC through a high current output buffer stage. It can drive 32-ohm phones to high level and provide excellent headphone sonic detail and performance. Bass Management functions include independent selection of a 2nd order Butterworth Low Pass and High Pass filter set. The main speakers can be run full range or rolled off below frequencies from 40 to 120 Hz. The Subwoofer Low Pass can be set for full range or frequencies from 40 to 120 Hz. This approach drives maximum flexibility to optimize the integration of a subwoofer. There is also +/-6dB of gain trim range on the subwoofer output. There are 2-line level analog inputs that provide 110dB of dynamic range and can be used for legacy analog sources such as tape, tuner or a Home Theater bypass where the volume level would be set to a high setting (84.0) on the ACI 600 and volume is controlled through the Home Theater processor. These inputs enhance the ability to integrate the ACI 600 into many different systems with many different signal sources. Our precision filter and equalizer functions use the power of a custom 64bit DSP engine embedded into the internal signal path. Bel Canto’s approach removes the possibility of any degradation due to noise, distortion or response errors introduced by traditional analog filters. In other words, our approach permits subtle equalization and tonal control without compromising the sonic integrity of the original signal. The Tilt function allows you to trim High frequency and simultaneously boost low frequency equally (or the opposite) to dial in the tonal balance you desire. This is done by holding the axis point of 775Hz and adjusting in a see saw fashion the upper and lower frequencies. This is ideal for eliminating the minor flaws in recordings or in sonically challenged spaces. The bass EQ gives you great control over low frequency energy below 200 Hz helping you to achieve the tonal balance you desire in room and with speaker placement. It operates over a +/-3dB range with 0.6dB increments (–5, Off, +5) providing subtle optimization of bass energy. The High Pass circuitry, inserts a high-pass filter into the main speaker output path optimizing the performance of your speakers with the sub output. You can also independently insert a low pass filter into the subwoofer output to help control sub levels. The filters are adjustable anywhere from 40Hz to 120Hz (in increments of 10Hz), depending on the low-frequency extension of your main speakers and the size of your subwoofer. The provision of these high-pass and low-pass filters is far-sighted, as it enables far superior integration of your main speakers with your subwoofer than would otherwise be possible. The control menu also has a ‘maximum volume’ setting. This allows you to set the max volume at any level you prefer and ensures no one can inadvertently increase the volume using an App volume control or the remote and do damage to your speakers. The Max volume can be changed at any time and comes from the factory set at 85. The Ethernet connection on the rear panel allows you to update your unit firmware to the current specification at any time the unit is connected to the internet. This can be checked through the menu by the user. If there is an update you will be given the choice to complete the upgrade ensuring that your unit is always up-to-date or decline the update and perform it at another time. If you choose to complete the update the unit will display the latest software Rev’s on the display and let you know when it is completed. The unit will reset itself (you do not have to power cycle the unit) and be ready to play after completion. 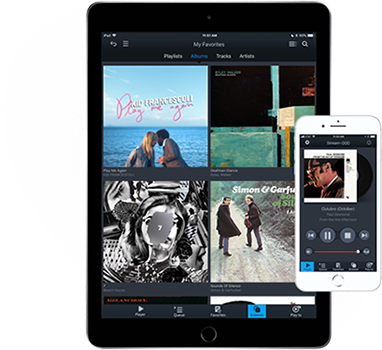 SEEK is conveniently designed with a connection to both TIDAL and Qubuz subscription services. Simply load your account information into the SEEK app to beginning streaming music from both services. There is also the option to stream internet radio with vTuner at no additional cost. The SEEK app also controls content stored in the cloud from Dropbox or OneDrive to ensure you music files are safe. The Bel Canto components also have a USB-A port that allow you to attach a portable drive and control content with SEEK.